Consider this recipe my greatest testament to my love for almonds. Really, this smoothie was inevitable. 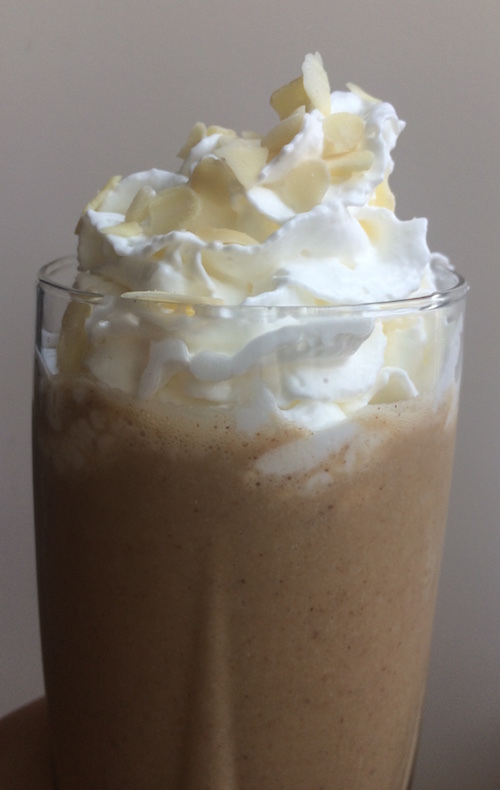 I cut down a lot on my caffeine but on the days I need a boost, I’ve been making this dairy-free smoothie which is full of protein and potassium. I call it “triple almond” because I basically OD on it — I use almond butter, almond milk, and actual almonds in it. I also started adding raw maca powder to this. Maca is a potent, ancient Peruvian superfood with plant protein and fiber that naturally energizes you without the caffeine crash. 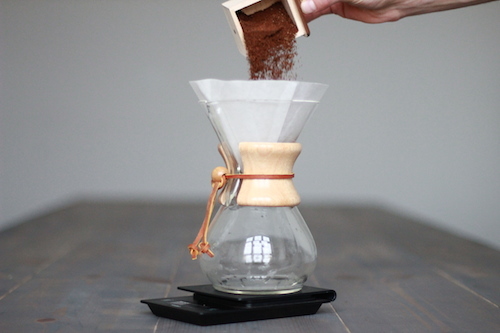 Technically, you can totally make this without the coffee for that reason but I like its flavor personally. 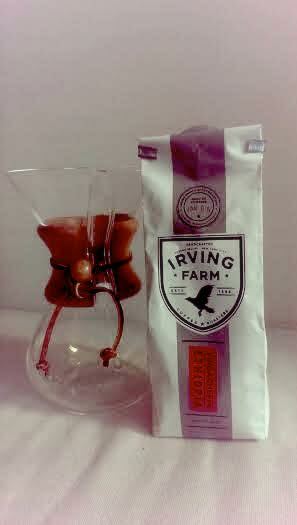 If you have decaf go for it–you’ll still get the energy boost. Maca’s actually a pretty intriguing ingredient, according to the website it says “the maca root was prized throughout the Incan empire for its adaptogenic-like qualities that enable it to nourish and balance the body’s delicate endocrine system, and to help cope with stress…it can aid in reproductive function, helping to balance hormones and increase fertility.” Dang. I originally bought this powder for the Jennifer Aniston smoothie I tried recently, but since I spent $23 on a packet of this I decided I might as well throw it in more of my meals. 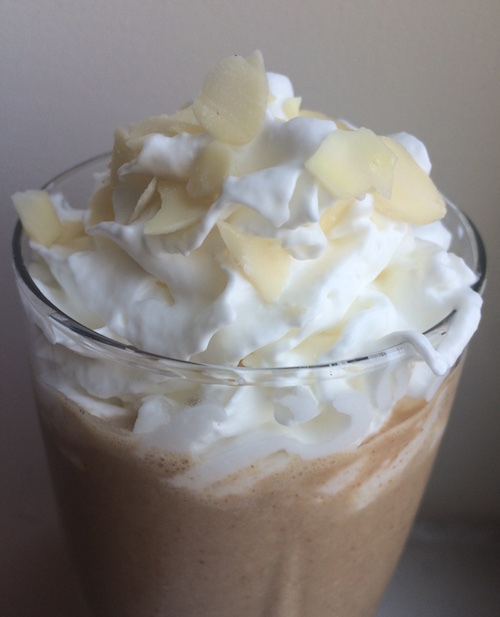 PS I added whipped cream and sliced almonds for the picture–quadruple almond smoothie?– but normally I’d just take this plain. It’s nice to add those little touches if you have guests though! 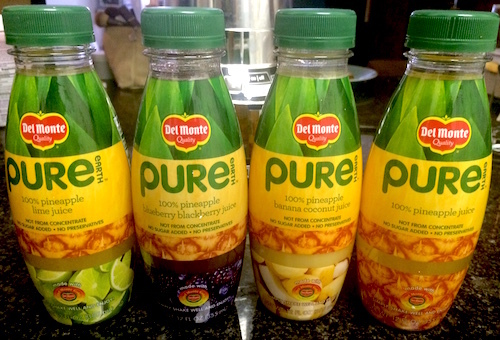 This was an easy task to get me on board with: Make a recipe using Del Monte Fresh Juices which uses Del Monte Gold pineapples handpicked from farms in Costa Rica. We had pineapples and fresh fruit every single day during our stay in Costa Rica, so just hearing that made me miss the place. Hence, it was with open arms I welcomed a package of new juices from Del Monte to get me back to making my breakfast smoothies. Usually I’ve been having just black coffee, but yesterday I started the day experimenting with a couple different ingredients which was a nice change in routine for me. This was a nice refresher to begin the day with using some of my favorite ingredients to compliment the pineapple-lime juice variety: ginger and kale! Combine all the ingredients and blend! 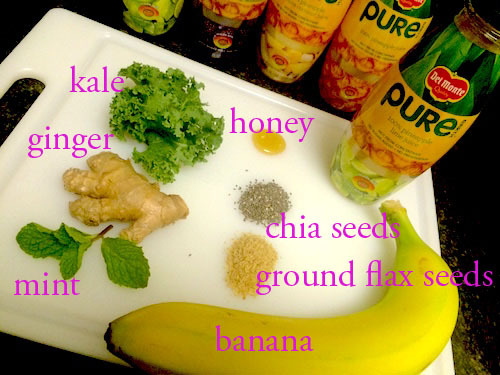 I love adding ginger to anything not only for the zest but for its detoxing properties. 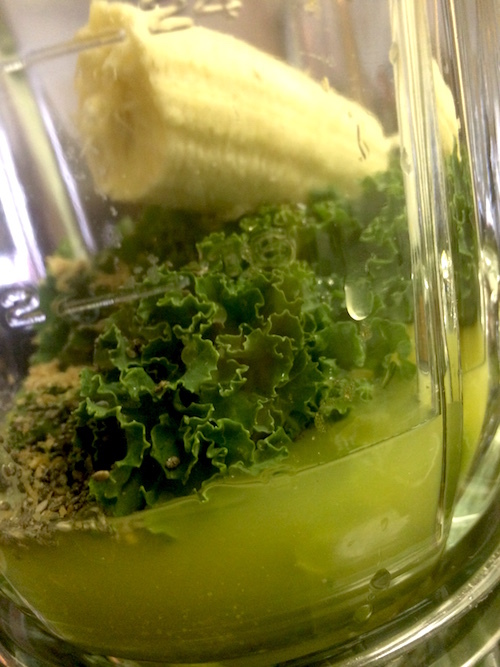 Kale, of course, is a great antioxidant and source of vitamin A, and C. I also add chia seeds and flaxseeds to any smoothie I make for its fiber content. The banana I decided to add just to thicken it up a little, and I’d say the honey is optional since the juice itself lends a lot of sweetness to it as it is — I might skip it next time. This tasted great and kept me laser focused and ready to hit the ground running at work once I got there. 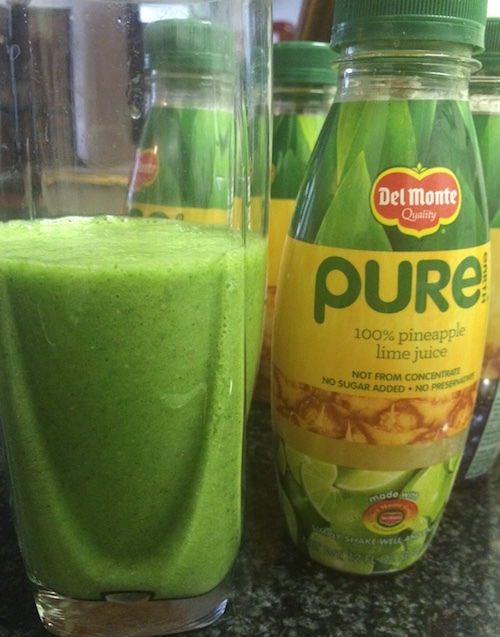 Del Monte Pure green smoothie! 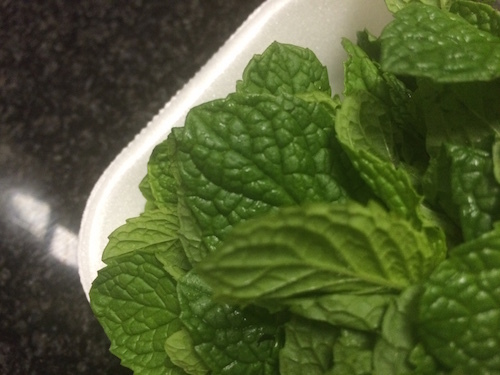 *Thanks to Del Monte for sponsoring today’s recipe! Here’s a nice gift for the coffee lovers: When you buy new Starbucks Refill Tumbler ($30), the recipient get’s a free grande brewed coffee every day in January. Talk about gifts that keep on giving! 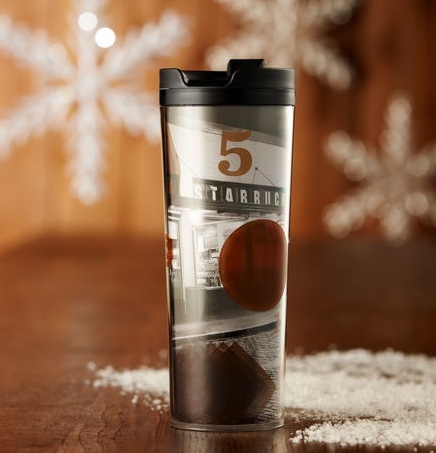 This tumbler sports and image of of the original Starbucks Store in Seattle’s Pike Place. 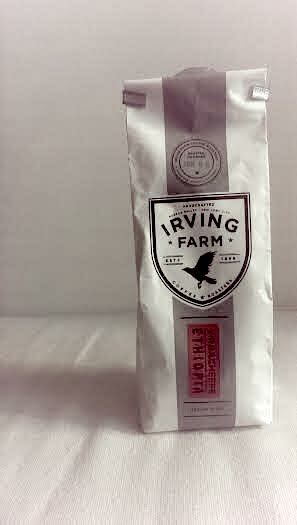 Available at Starbucks stores or StarbucksStore.com. Nov 13-17: Starbucks buy one, get one free offer! 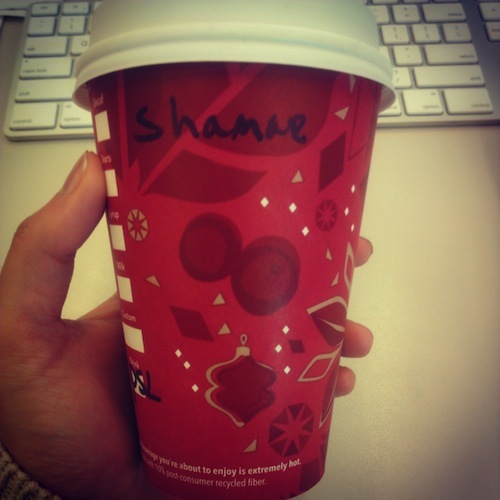 That’s my cup of Pumpkin Spice Latte, misspelling forgiven. If you love Starbucks, mark this on your calendar: Enjoy a “buy one, get one” offer on November 13-17th from 2-5pm when purchasing any of their holiday beverages (that includes hot, iced, and blended versions of their Peppermint Moncha, Skinny Peppermint Mocha, Gingerbred Latte, Eggnog Latte, and Caramel Brulée Latte). 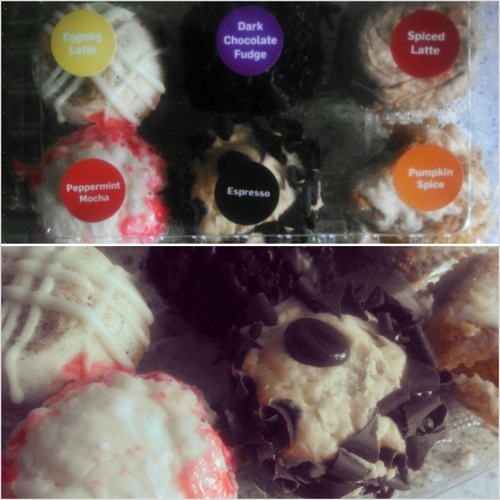 Coffee-Mate releases new holiday flavors! Coffee-Mate is a staple in my kitchen (mostly thanks to my roommate Amina, and also now that I need a creamer to accompany our beautiful espresso machine). 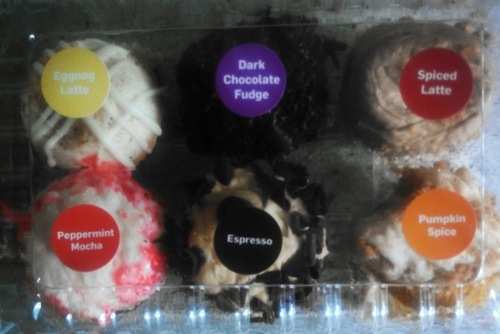 Now, they come in some sweet seasonal flavors, including Pumpkin Spice, Spiced Latte, Dark Chocolate Fudge, Eggnog Latte, and Peppermint Mocha. They’re available only until December, so get started on spreading that holiday cheer :). Available at grocery stores for $4 each.